Your thesis is intuitively appealing. I’ll respond by modifying slightly the framework use in your approach, without becoming specific about conclusions. I’m not sure I really answered any big questions here, but see what you think. I think you’ve described a process whereby new money created by QE creates a sort of financial disequilibrium, and that subsequent activities by banks and non banks tend to rebalance the proportion of money in the system. Overall, I’d approach this along three dimensions. The first is the bank/non-bank structural mix of the system. The second is a conceptual “equilibrium” with corresponding “out of equilibrium” conditions. The third is the expected impact of QE specifically. In terms of general structure, banks are “issuers” of money and non-banks are users of money. This may seem like the currency issuer/user framework of MMT. It’s compatible, but not the same. Money in context here is defined specifically as bank deposit liabilities created by commercial bank lending or asset acquisition – not reserves or currency issued by the central bank. The central bank and the government are set aside, except for their incidental role in QE. So, with that definition of money, we can say that banks issue money when they make loans. Non-banks don’t issue money. But they do issue other types of liabilities. Moreover, non-banks are users of money when they lend. Finally, as users of money, non-banks must source money before they lend it. E.g. a bank loan creates a deposit. A non-bank issues 30 day commercial paper to attract bank money (from an existing deposit) which it then lends it out. There is a reason why I wouldn’t frame it this way. You say that bank lending increases short duration liabilities (deposits), whereas non-bank lending reduces short duration assets. I would say that bank lending increases short duration liabilities (deposits) while non-bank lending leaves them the same. With bank lending, deposits are increased. Those new deposits start circulating around the banking system according to the transactions that begin with the borrower’s disposition of the funds he has borrowed. With non-bank lending, money from existing deposits is sourced by issuing a non bank liability, and that money through subsequent lending continues to circulate around the banking system in the same way. So the difference is that banks create new deposits when they lend (as money issuer); non-banks as money users create a conduit for the circulation of existing bank deposits. It is well known per MMT that banks don’t need reserves to lend. That is a structural feature of banking that holds at macro and micro levels, given the assumption that the central bank can always provide required reserves to an individual bank at what usually is a penalty rate. However, that doesn’t mean that individual banks do not undertake precautionary liquidity management policies and strategies in order to ensure ready access to their required share of system reserves – i.e. access WITHOUT having to go to the central bank for reserves. This is a central feature of actual modern monetary operations, and is consistent with the Basel emphasis on liquidity management as well as capital management. ... With banks, liquidity management in large part takes the form of liquid asset policies and liability policies that limit concentrations in short dated funding maturities. Liquidity management for banks is effectively an insurance concept for ready access to required share of system reserves without having to access the central bank. It should be noted that this actual feature of the system is something that many proponents of MMT say is unnecessary – as with the Mosler proposal to provide fed funds freely to banks, without the “self-imposed” constraint of liability management as it is practised now. I’m not here to debate that point – just describe how the system works now. More generally, we know from MMT (and otherwise) that banks don’t need pre-existing system reserves to lend. They lend on the basis of credit worthy customers and capital and find the reserves in response. Ex post “reserve finding” in this sense is enabled by normal liquidity management policies. The important causality here (with or without MMT type prescriptions) is that that banks don’t lend on the basis of reserves or liquidity. Liquidity management is a pre-planned facilitator of payments capability – not a driver of lending strategy. Lending is based on borrower demand, risk assessment, and capital adequacy. That is a causality that remains a fact, even with precautionary liquidity management practices. The great error of the multiplier theory is that it asserts that reserves – and by logical extension liquidity – drive lending capability. Here there is a rough similarity between banks and non-banks. Similar to banks, non-banks also don’t lend merely on the strength of their liquidity positions. They use liquidity management just like banks – to facilitate payments – but in the non-bank case, the medium of exchange for payments is bank money (bank deposit liabilities), and not bank reserves. Non-banks have a similar framework for lending criteria, including credit risk and capital criteria. They happen to have different asset-liability structures than banks, particularly on the liability side. Liquidity management is roughly similar. Banks don’t like to “back into” the central bank for an emergency loan so they like to ensure ready access in the normal course to their share of reserves. Non-banks don’t like to back into their commercial bankers for an emergency loan, so they like to have ready access to deposit money. The constraint on non-banks is arguably more rigorous in the sense that their own credit lines with their commercial bankers are probably more binding that the implied ones that commercial banks have with their central bankers. But in the same way that banks don’t need reserves for lending, non-banks don’t necessarily need a particular level of liquidity for the same purpose. It certainly doesn’t hurt a bank to have excess reserves in order to clear payments made when a borrower takes his funds to another bank. And it certainly doesn’t hurt a non-bank to have excess money or excess liquid assets to sell in order to clear money payments made when a borrower takes his funds to another bank. But at the systemic level, the banking system doesn’t need reserves and the non-bank system doesn’t need some prerequisite level of liquid assets in order to clear payments. In short, liquidity in either case is not the driver of lending. Liquidity is useful in ensuring that payment obligations are met that result from lending (or from deposit withdrawals, or from liability maturities for that matter). But banks typically have ready access to normal forms of liability management as well as the central bank, while non banks have access to their own liability management sources and their commercial bank credit lines. QE works one way or another via the commercial banking system. The central bank can buy bonds from either banks or non-banks and issue reserves in settlement with banks, who act either as principals or as agents for non-bank depositing customers. But it’s largely unrecognized that most QE volume will consist of bonds ultimately sourced from non-bank portfolios, since that’s where most of the bonds are. And many of the bonds sold to the central bank by bank dealer operations will represent pass-through transactions (perhaps with dealer positioning lags) from non-banks to the central bank. QE affects bank reserves directly if bonds are bought from banks. 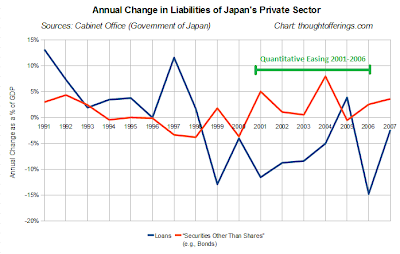 But to the degree that bonds are sold ultimately by non-banks, QE affects both reserves and bank deposit liabilities. Since I’m suggesting the latter is the norm, we can see that most of QE volume will increase money holdings of non-banks. If most QE is hitting the balance sheets of non-banks, that means that non-banks are replacing bonds with money. So the question becomes, what are the non-banks going to do with that money? To answer this, we must first answer the question about why the bonds were there in the first place. The answer I think is they were likely there as part of liquidity management operations or investment operations, broadly speaking, as I described. So the non-banks end up with money instead of bonds. That improves the quality of the non-bank’s liquidity position since money is technically more “liquid” than bonds - although bonds are not much less liquid, given their repo potential. So how does this affect non-bank lending? Treasury bonds are held by all types of financial institutions and others. They’re generally held for liquidity or investment purposes. I’m not sure that a non-bank’s lending strategy is going to be changed all that much by selling treasury bonds for cash. Does the fact that such a liquidity insurance or investment function fund switches from bonds to cash automatically trigger new lending? I’d say it’s nowhere near that direct an effect. The considerations relating to borrower demand, credit risk analysis, and capital adequacy all remain for both banks and non-banks. The main effect of QE is on yields, and even that is limited. The yield effect percolates throughout the credit spectrum, as portfolio managers react to them and look at new opportunities to buy and sell all sorts of financial assets. No doubt this will have some favourable effect on lending conditions, but the question is how much. Finally, QE is a response to a liquidity trap that includes deleveraging. Deleveraging in the case of bank borrowers means that loans are repaid with money, which means the destruction of money. So QE is responding in part to a money destruction process by creating replacement money. QE is responding in that sense to an out of equilibrium situation, attempting to move back toward equilibrium. This description differs somewhat from your own, in which QE creates a disequilibrium in which non-banks subsequently start making adjustments to reverse the creation of money associated with QE. You gauge the QE effect as “disturbing” ideal equilibrium in the direction of an oversupply of money, with subsequent adjustment back in the other direction. But consider that the current liquidity trap position is already “out of equilibrium”. So the injection of money may be more corrective overall than disturbing. Those are my thoughts. I think your theory has to do with a sort of equilibrium between bank lending and non-bank lending, and between bank created money and non-bank created non-money liabilities. I agree with the general intuition of it, but would adjust the approach as indicated. As to whatever conceptual “equilibrium” may be, it is no doubt illusive in practice, and chasing it is always a matter of risk, capital, and pricing for both banks and non-banks. Thank you for your detailed response! Your knowledgeable input is always highly valued (by me and others). I should be able to post a reply within a couple hours. Your comments included lots of useful details such as the liquidity management of banks and non-banks (thanks! ), but it also seems I may not have explained some aspects of my "thesis" well enough. I'll respond to some of your points and try to clarify the ideas I was trying to express. "I think you’ve described a process whereby new money created by QE creates a sort of financial disequilibrium, and that subsequent activities by banks and non banks tend to rebalance the proportion of money in the system." Yes, that was a big part of it, though I didn't consider the QE impact to be the core point, just one of several derived conclusions. The core thesis was really around the way that bank loans, because their quantity is not constrained by availability of existing funds (other than capital, which can always be raised), should anchor interest rates for all types of lending to levels roughly reflecting the "fundamentals" of credit risk, inflation risk, interest rate risk, etc. That is, the existing supply of money and supply of loans or bonds in the system need not have much impact on interest rates beyond short term fluctuations. The QE conclusion as well as several others are derived from this. The QE conclusion seemed particularly relevant with all the talk out there of how QE should lower rates by reducing the supply of long term debt assets (a conclusion I question for several reasons). Since reading your reply I've thought through how to express this in a series of supply/demand graphs (for example, the supply curve for bank lending ought to be horizontal). There's a chance I can compose and post them by some time tomorrow but if not I hope to get your attention another day! "E.g. a bank loan creates a deposit. A non-bank issues 30 day commercial paper to attract bank money (from an existing deposit) which it then lends it out. This base case differs somewhat from your description - "So the KEY difference from a lender perspective is that bank lending requires accepting a new short duration liability, while non-bank lending requires giving up a short duration asset." "
You have focused on the specific case of a non-bank that is an intermediary between investors and borrowers (as I understand it they usually pool assets). While these entities do seek to make loans of their own accord, my focus from a macro perspective was on the two types of entity who might ORIGINATE a decision to acquire debt assets: banks and investors. At a macro level, the non-banks are completely at the mercy of how many investors are willing to fund them. I.e., the non-banks are only a facilitator for those who really get to choose whether to hold deposits or seek higher yielding assets by lending, and without those end investors, the intermediaries would not get funding to pass through into new lending or asset purchases. Yes they may make some of their own decisions about whether to lend or not lend with deposits they hold, but I think those are less relevant at the macro level, especially if the decisions are mostly liquidity-driven. Most would choose to be as close to "fully invested" at any given time as their investor prospectus and liquidity needs allowed. So while at a micro level I agree that the non-banks are making lending decisions, at a macro level I think it is better to ignore them and focus on those with ultimate decision power: banks versus potential investors. Also, there is also plenty of direct (non-intermediary) lending outside the banking system (e.g., corporations issuing bonds to raise money). "There is a reason why I wouldn’t frame it this way. You say that bank lending increases short duration liabilities (deposits), whereas non-bank lending reduces short duration assets. I would say that bank lending increases short duration liabilities (deposits) while non-bank lending leaves them the same." I agree with your last statement, but I think it only focuses on half the story. That non-bank lending leaves [short duration liabilities] the same was intended to be implicit in my comparison. I realize my comparison twists the common perspective a bit -- instead of talking about the non-bank's money being "sent to" the borrower, it talks about the effects of each balance sheet in isolation, disregarding the story of what "moves" where. But I thought it provided important back-story to my explanation of why interest rates determined by banks and non-banks should be the same with respect to fundamentals (before the supply function from non-banks enters the picture). That was the rationale behind this comparison. Or perhaps you were talking about at the macro level of the economy-wide effect, whereas in this case I was talking about the individual lender's balance sheet. It is true as you say that "bank lending increases short duration liabilities (deposits) while non-bank lending leaves them the same", at the macro level. But looking at a single lender's balance sheet, my statement that "bank lending requires accepting a new short duration liability, while non-bank lending requires giving up a short duration asset" is also true. And that was my basis for the rate determination discussion. "However, that doesn’t mean that individual banks do not undertake precautionary liquidity management policies and strategies in order to ensure ready access to their required share of system reserves i.e. access WITHOUT having to go to the central bank for reserves." You walked through some useful analysis of liquidity but I don't see it as too relevant to the macro-level analysis I was attempting (that could be me misunderstanding you, though). "But it’s largely unrecognized that most QE volume will consist of bonds ultimately sourced from non-bank portfolios, since that’s where most of the bonds are... Since I’m suggesting the latter is the norm, we can see that most of QE volume will increase money holdings of non-banks." Yes, I think that's consistent with my post, though I didn't explicitly mention the fact that some QE could target treasuries held by banks themselves. "So the question becomes, what are the non-banks going to do with that money? To answer this, we must first answer the question about why the bonds were there in the first place. The answer I think is they were likely there as part of liquidity management operations or investment operations, broadly speaking, as I described." This seems like perhaps one of your key points of differentiation from what I described. But I happen to think it doesn't matter why the bonds were there in the first place. The main reason is that it doesn't have to be the entity that sold bonds to the Federal Reserve who is the next in line to lend to someone else (e.g., perhaps via the non-bank lending market). At a macro level, one entity might sell bonds to the Fed during QE, deciding they want to hold deposits for a while for whatever reason. Meanwhile elsewhere in the economy, another entity might be in the process of deciding that they want to earn more than the deposit rate and have a long enough time horizon, and they might offer their money in the lending market. Perhaps a few months later the first entity would decide the time/price was right to do some lending again. The whole thing is very dynamic, just like job losses and hires that are going on all the time, regardless of reported net losses/gains for the month. Organizations and investors sell treasuries all the time even when there is no QE happening. But every time the Fed buys treasuries, assuming a non-bank does the selling, then there is more money left in the system than the transactions in which treasuries trade between two parties within the private sector. That effect should accumulate over time into more deposits, but I've argued some portion of those deposits will have a propensity to fund new [or refinanced] borrowing. "So how does this affect non-bank lending? Treasury bonds are held by all types of financial institutions and others. They’re generally held for liquidity or investment purposes. I’m not sure that a non-bank’s lending strategy is going to be changed all that much by selling treasury bonds for cash. Does the fact that such a liquidity insurance or investment function fund switches from bonds to cash automatically trigger new lending? I’d say it’s nowhere near that direct an effect." To recap my two points earlier, (1) I would focus on the end investor, not the non-bank intermediary, and (2) it doesn't have to be the investor who just sold who is the next one to be ready to lend. My point had been that over the medium term (months to years), "too many deposits" would lead to increased demand for non-bank style lending, thus destroying those extra deposits. Of course there may be examples of where there is a short term sell-treasuries-then-do-new lending effect from a single investor, even though it's probably the minority. For example, an active trader sells a treasury to the Fed and then buys a new corporate bond issue (or even just shares of a a bond mutual fund). That corporation may be refinancing from a bank loan into a bond because of better rates or terms. And thus the extra deposits generated by the QE purchase would be destroyed. "The main effect of QE is on yields, and even that is limited. The yield effect percolates throughout the credit spectrum, as portfolio managers react to them and look at new opportunities to buy and sell all sorts of financial assets. No doubt this will have some favourable effect on lending conditions, but the question is how much." This mostly makes sense to me, but as you saw above I questioned whether there would be any lasting effect on yields, given that market participants ultimately bid asset prices to whatever level they on average deem fair value, mostly independently of the quantity of such assets in the system. "Finally, QE is a response to a liquidity trap that includes deleveraging. Deleveraging in the case of bank borrowers means that loans are repaid with money, which means the destruction of money. So QE is responding in part to a money destruction process by creating replacement money. QE is responding in that sense to an out of equilibrium situation, attempting to move back toward equilibrium." Deleveraging occurs across both bank loans and non-bank forms of debt (bonds, securitized mortgages and loans, etc), so on balance I'm not sure the deleveraging process would impact the equilibrium I'm describing, unless there was some reason for it disproportionately occur for just one of the two types of debt. 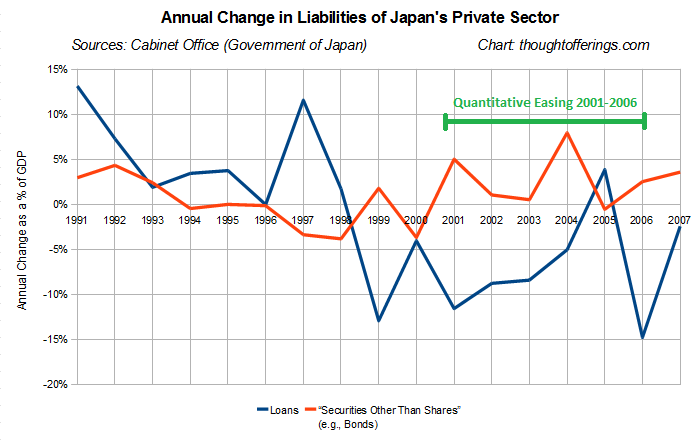 Also my post included a graph of Japan's QE period. My assumption was deleveraging was occurring in both types of debt for those who needed to pay down debt, but that an independent layer of activity in parallel to that process involved refinancing of bank loans into other forms of debt, as well as new borrowing needs disproportionately favoring non-bank forms of debt over bank loans (as a result of the "excess" money supply seeking investment). "Those are my thoughts. I think your theory has to do with a sort of equilibrium between bank lending and non-bank lending, and between bank created money and non-bank created non-money liabilities. I agree with the general intuition of it, but would adjust the approach as indicated. As to whatever conceptual "equilibrium" may be, it is no doubt illusive in practice, and chasing it is always a matter of risk, capital, and pricing for both banks and non-banks." I'm not sure the equilibrium I described is anything to be consciously "chased" (perhaps I didn't understand your use of the word). I consider it more an "automatic" macro-level effect emerging out of and in turn influencing the multitude of borrowing and lending decisions happening in the economy. Anyway, THANK YOU again for your thoughtful comments! At the very least they forced me to clarify some of my thinking, and I learned a bit as well. At this point I'm not sure I'd change any of my conclusions, but would love to hear from you (or others) if you think I made any logical errors or described things that aren't realistic or feasible given the real world financial system. I think you’ve tackled an interesting subject, and I’ve really only given you some quick feedback on how I might begin to approach it myself. If it’s been helpful in testing some of your thinking, that’s probably as much as we could hope for. I have no real issues with how you’ve explained things or your logic, etc. BTW, my approach was to allow for the widest, most general possible interpretation of “non-bank”. It could be a non-bank financial institution such as a stand-alone investment dealer or a mutual fund or an insurance company; a corporation; or even a household. I think I used terms including both “lending” and “acquiring financial assets” in covering their asset activity, including liquid assets and investments, so the comparison in no way was meant to be restricted to non-bank lending. My language may have been so loose and generic that it obscured how wide in scope I intended it to be. My main point was to get across the basic idea that any of these entities can issue liabilities and acquire financial assets, and that they are all users of bank money in doing so – unlike banks, who are issuers of money. Their use of money compares with a bank’s use of reserves, and their issuance of non-money liabilities compares with a bank’s issuance of money. Those are the dimensions I would contrast in looking at relative behaviours. And I should have followed up on the liquidity discussion with the observation that non-banks who sell treasury bonds in QE may merely use that money in an alternative liquidity vehicle rather than make decisions to take on risk longer term as a replacement for the bonds, such as lending or other risky investments. BTW, I really didn’t get as far as considering in detail how interest rates are transmitted throughout the system or how they adjust as between banks and non-banks, so I wouldn’t read anything into my having missed some of your key points in terms of how well you explained your thesis. I probably just didn’t get that far before offering a response, out of time considerations more than anything else. I liked your analogy between banks as users of reserves and non-banks as users of bank money. I think there must still be some disconnect in our discussion regarding how broad the term "non-bank"s is, and I may simply be missing your point. As I understand it, we were talking about non-banks specifically in their role as lenders. As a lender, there is no need for a non-bank to issue liabilities unless it is an intermediary between investors and borrowers. For example, a household that wants to lend to a company by buying its bond isn't issuing any liabilities to do so, but Fannie and Freddie as intermediary-style non-banks issue liabilities in order to fund their lending (or asset buying) activity. In that way I think that bank and non-bank lenders are different, because as you've pointed out banks as lenders DO issue liabilities (money) when they lend. Sorry to hear you didn't tackle the interest rate side of things as that was an important part of the post, but I certainly understand constraints on time etc! It was nevertheless a pleasure to have you stop by and share your directional thoughts on the framework. Came across this post from Winterspeak's site. Will comment more - btw such questions have been thought about in Post Keynesian Economics literature. "Circuit and Coherent Stock Flow Accounting" by Marc Lavoie, in particular Section 9.3.1 of the chapter. The question asked is "If loans make deposits and if the private sector doesn't want to hold it what happens" - Marc tackles the question using Wynne Godley's stock-flow consistent methods. The question is asked for a simple "artificial economy" however though and I am interested about it in the context of "Last Scale Asset Purchases" by the Fed. But excellent article. Yes, IS-LM is loanable funds approach. Assumes an exogenous supply of money. One key concept I tried to communicate in my post is the fact that once you recognize that banks can extend an essentially unlimited number of loans to worthy customers (i.e., a horizontal supply curve in the lending market), then all longer term interest rates are anchored to the risk "fundamentals" with only minor influence from supply and demand factors. From that flow various conclusions I posited. Would be glad to hear your further thoughts if you have them, and I will try to spend more time on your reference. Yes of course simpler than you were considering. The problem is that it runs into zillions of equations if one wants to be more realistic. I was just trying to highlight a kind of mechanism you have suggested. In the simple economy, if households want to reduce their deposits, they may purchase more equities and this will cause firms to borrow less from the banks - because its more attractive to issue new equities etc and reduce their indebtedness to the banks. Similarly, if households want to hold more money, firms will need to take more loans from banks compared to issuing equities. Such kind of mechanisms. So its a bit similar to "the private sector will tend to favor bank loans (with their associated money creation) over non-bank loans, until the money supply increases enough to satisfy the private sector's liquidity desires." kind of mechanism you have thought of. "Graziani (1992, p. 218) is crystal clear on this issue: 'It is the decision of savers to keep part of their savings in money form that forces firms to ask for bank credit.'" "However, at the end of the period, it is the portfolio decisions of the households that set the existing amount of money in the system. The causality becomes reversed. The stock demand for deposits determines the amount of outstanding loans. The more deposits households wish to hold, the more firms will be unable to repay their bank debt..."
It seems to me (though I could be mistaken) that they are considering the household's portfolio decision for deposits to be "save versus spend", whereas my post focused on "save as deposits versus lend [via non-bank mechanisms]". So they seem to link the demand for deposits directly to the amount of outstanding loans (which is true when you consider only bank loans), while I was suggesting that the choice between bank and non-bank borrowing, i.e. considering all forms of debt beyond just bank loans, BREAKS the link between amount of borrowing and quantity of deposits. But it's all clearly related, and now I see your latest reply regarding the portfolio choice to make a corporate equity investment, which is another good example that I didn't cover at all. So it does seem the circuitist literature covers a lot of this ground, though I wonder whether they have reached (or would reach?) the same series of conclusions I did. It's certainly not something I've seen covered in the econoblogosphere, even the wonkier corners. Would be interested to hear if you disagree with any of my conclusions, particularly as some of them deviate a bit from conventional wisdom (i.e., even most MMT authors suggest QE may sustainably lower long term interest rates a bit). Not at all - don't disagree with anything in particular - just forced me to think about many things and what you have written here seems very well connected to circutisists' work is what I wanted to point out. You don't see Circuitist stuff in the blogosphere because they don't blog! Plus a lot of them are in Europe and one has to know French to read them :). The Circuitists have serious stuff written and in fact were the first to start using accounting in Economics. Also in the article I cited, its not about consumption/saving but about allocating the saving in deposits versus other assets - equities in particular. A formal way to say this is - assume that the propensity to consume doesn't change but the portfolio preference changes. Even if the latter doesn't more money balances than what is desired by households - maybe because of more loans taken will change equity prices so as to eliminate the excess money etc .. those kind of ideas. There wont be any excess money because loans are always equal to deposits but more equity issuance. So a decision by firms to increase the funding requirement through loans will cause households to purchase more equities, so that the *amount* of loans taken is equal to the amount of money desired at all times in the simplified model. Also I just added a note with your link at the top of the post in case others stumble upon it.